Scott Chafen knows the meaning of sweat equity. Since Dutch Henry opened its doors in 1992, Scott has worn many hats: winemaker, cellar rat, sales guy, office manager, landscaper, olive picker, architect, delivery boy, forklift extraordinaire, customer service rep… ah, the myriad opportunities in family business. Scott’s initiation into the wine business began as forced labor on his father’s Massey Ferguson tractor. Many a vine suffered. Working his family’s vineyard in sleepy Calistoga soon led to stints as a cellar rat in a local winery where farming married production. Scott’s “learning curve” turned into a passion for the wine business. In 1990, Scott graduated from Occidental College with a B.A. in Philosophy and a minor in both Studio Art and Comparative Lit. After working a year in France Scott returned to Calistoga where he worked both in the vineyards and cellar of a local winery. 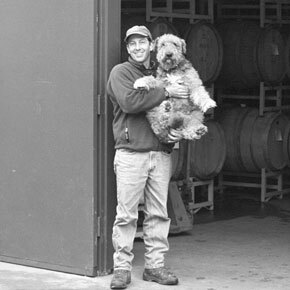 By 1992 Dutch Henry Winery was ready to open its doors with Scott as winemaker. Since day one the winery has been owned and operated by the Chafen family with Scott at the Helm of every vintage. Scott prides himself on being a wine “grower” rather than a wine “maker,” reflecting his personal philosophy that wines are made in the vineyard, not the cellar. Scott regularly finds time to hike, garden, play guitar, fill his wife’s glass, and teach his infant daughter new words.